After exploring Bryce Canyon National Park, Julia and I made our way towards Moab, where we would be spending a few days to enjoy the town, as well as Arches and Canyonlands National Parks. There is a rather direct route on HWY 70 that would have gotten us to Moab in a little over 4 hours, but we decided on a more scenic route, to allow for a stop in Capitol Reef National Park. Torrey is the support town on HWY 24 just before Capitol Reef National Park. We made a stop there, and I made good on my “burger a day keeps the doctor away” holiday saying. Capitol Reef is a huge, but largely visited National Park. Driving in, there is no visitor center or attendee toll. It’s actually a shame that the park is so unheralded, because it’s absolutely gorgeous. As soon as we drove in, I was filled with the instant regret of knowing I hadn’t scheduled for us to spend enough time there. Most of what I read online said it was a nice park to drive though, but not one to spend an entire day at. I’ve learned my lesson, and will be planning for a return trip in the Spring to do a little more exploring. After spending some time learning about the schoolhouse, we made our way to the trailhead for the Hickman Bridge Trail. The Hickman Bridge trail is a 1 mile hike with 400 ft of elevation gain. This is a balloon trail with views of the 133ft natural Hickman Bridge. The trail starts out alongside a musty creek before climbing into a narrow canyon. The trail in the canyon was silty and very soft underfoot. You could tell that this was not the place to be in a flash flood, as sediment and erosion where evident around every turn. One of the first awesome finds on this trail was a cave with bridges above. I took a little walk off trail to get a view from inside. After leaving the cave, the trail climbed for a short while before turning a corner. As we turned the corner, the Hickman Bridge came into view. I’ve been on many destination hikes in my life, and I can say without a doubt that this one does not disappoint. The size and scale of the Hickman Bridge is astounding, and one of those feelings that’s near impossible to capture with just a photograph. The trail finishes by ballooning underneath the bridge and wrapping around to meet up with itself. It was starting to get a little cold and dark at this time, as the sun was starting to set behind the canyon walls. Julia and I made our way back to the car, and continued on through Capitol Reef National Park to take in the dwindling views. 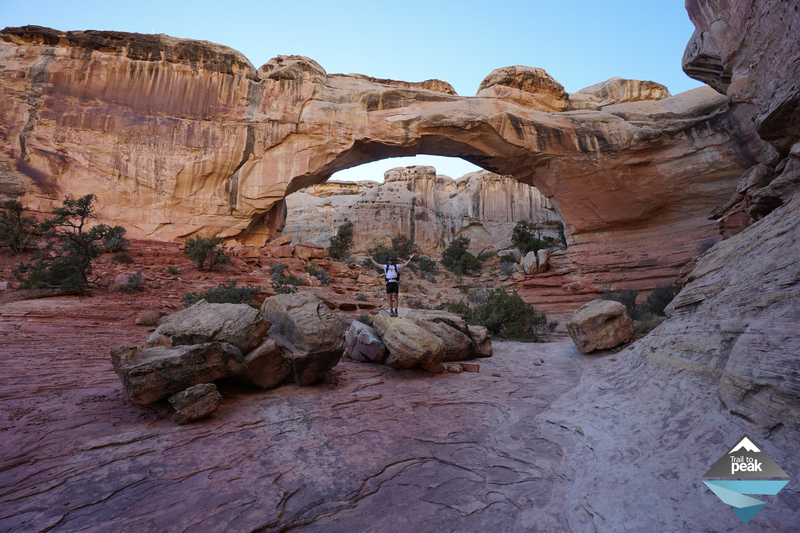 Our visit to Capitol Reef National Park was sweet, but way too short. Luckily, the drive out towards HWY 70 and Moab made for a sundown spectacle. We pulled off on the deserted road more than a few times to just stop and take it all in. In my heart and mind, I knew I had to return. Moab, Arches, and Canyonlands were waiting for us in the days ahead though, and our excitement to see those places was pushing us forward. Never got here, but looks like a worthy stop too. I’m loving your southwest adventure! It’s a great little day trip. Thanks, Anna! I love this area! I’m going to checked out this hike next time I’m there! I was in this area for the first time this past spring. This makes me want to go back right now! I will have to check this area out next time. Great photos! Thanks, Melissa! Hopefully you can go back and visit soon! Wow, what a beautiful place! Fantastic shots! Utah is at the top of my list of places to visit, just need to carve out some time since it’s a long drive away. Thanks, Oleksandra!! Utah is a gorgeous state! It’s the least visited of the 5 parks in Utah. It’s definitely worth a stop on the drive over from Bryce to Moab!